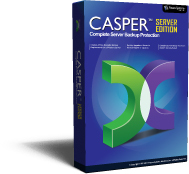 Is Casper Server Edition compatible with Windows NT? No. Casper Server Edition does not support cloning Windows NT 3.x or 4.x platforms. Does Casper Server Edition support Windows 2000 Server or Windows 2000 Advanced Server? Yes, but background copying is not supported on either Windows 2000 Server or Windows 2000 Advanced Server. Does Casper Server Edition work with RAID? Yes. Casper Server Edition is designed to work with all hardware based RAID arrays. Which RAID levels are supported by Casper Server Edition? Casper Server Edition is designed to work with all RAID levels supported by hardware based RAID controllers. Does Casper Server Edition work with Solid State Drives (SSD)? Yes. Casper Server Edition has complete support for solid state and Advanced Format (4KB sector size) devices. Does Casper Server Edition work with SAS and SCSI drives? Yes. Casper Server Edition is device independent. Does Casper Server Edition work with eSATA drives? Does Casper Server Edition work with external USB and Firewire drives? Does Casper Server Edition support copying of Windows Dynamic Volumes? While Casper Server Edition does support copying of Dynamic Volumes, it does not support cloning of Dynamic Disks. This means Casper will not allow you to copy an entire hard disk to or from a Dynamic Disk even if the Dynamic Disk is fully self-contained (e.g. defines a simple volume that is not striped, mirrored, or spanned across multiple disks). However, Casper does support copying of dynamic volumes to other volumes and Basic Disks where possible. When copying a dynamic volume, Casper will copy only the contents of the volume. It will not copy or recreate the actual data structures to reproduce the dynamic disk(s) by which the volume is defined. Dynamic Volumes include volume sets, stripe sets, stripe sets with parity, and partitions located on disk mirror/duplex sets configured using the Windows Disk Administrator. Can Casper Server Edition be used to copy a network drive? While Casper Server Edition has limited support for copying from mapped network drives (remote shares) to a local drive, it does not support copying to mapped network drives from a local drive.